It won't be Sean Monaghan nor Nathan Cleverly that take on WBA regular lightheavy champ Juergen Braehmer (47-2) in Neubrandenburg March 12 on this Sauerland Event promotion. Instead it will be former stablemate Eduard Gutknecht (29-3-1) that gets the chance, writes the always well informed Bild. Gutknecht and Braehmer clashed in 2013 and Braehmer won the EBU title with a unanimous but disputed decision. Since then Gutknecht lost to Dmitry Sukhotsky and drew with Pablo Sosa and he and Sauerland parted ways. 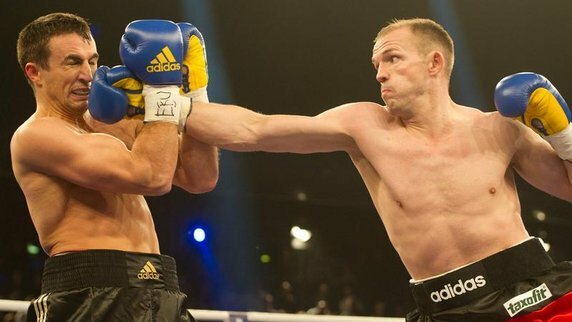 Gutknecht is now with Wiking Box Team and was last year twice set to fight Sauerland signed prospect Tyron Zeuge, who however first was injured and then ill and the fight fell through. Gutknecht knocked out late sub Arman Torosyan and became mandatory challenger for the vacant EU title – but now gets a World title fight instead.